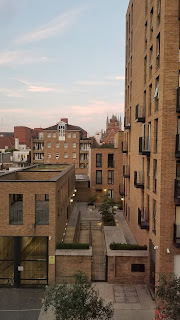 This is a continuation of what'll be a series of blog posts about my trip to the UK this September. Part 1 of Day 1 is here. This is Part 2 of Day 1. It'll be shorter than Part 1. Promise. After traipsing around the vicinity of Kensington Gardens in search of Peter Pan-related sites, I switched gears to focus on another literary masterpiece meant for children[ish]: Harry Potter. A bit of background seems in order. Yes, I'm going to bore you with tales of my childhood. Buckle up. I first encountered Harry Potter in, I believe, eighth grade. I'd heard of it but hadn't read any of the books yet. I recall being into Dear America, Animorphs, and Garth Nix books at the time (possibly Garth Nix came later), and at about this time I started reading adult nonfiction (about the Tudors, mostly). In any case, our eighth grade English teacher did her own homemade audio-book of the first HP book and played it for us in class (or did she read it aloud and it was another book that was presented via homemade audio-book? I can't actually recall). I'm pretty sure we didn't finish it in class, but I got the book on my own and read it, then Chamber of Secrets. This would've been, '00 or '01, if I'm getting this all right, so I was 12 or 13. I do recall that the third book was not available in the school library but that when it was, another girl in my class and I rushed to grab it. I don't remember who got that copy. I think it ended up that there were multiple copies and we both got one. I have very fond memories of sitting on the lawn on dusty, sunny, hot summer days, reading Harry Potter (4 ,5, 6, and 7). I won't say Harry Potter changed my life or got me to read, or really influenced my world-view. I was already a reader and had a host of other influences in my life. But I loved the fun and the plot twists and the detailed world that JKR built. The world became a part of my general makeup. The same way I know (sorta) the geography of the United States, I can tell you the names of all the Gryffindors in Harry's year and the incantation to unlock a door. 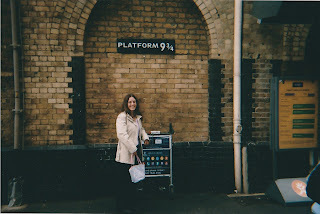 So back in 2005, before the last book came out, when me and my mom went to London for my 18th birthday, one of our stops was King's Cross Station, to see Platform 9 ¾. At that time, I believe, you could just walk up; there was no ticket barrier to get to platforms 9 and 10. 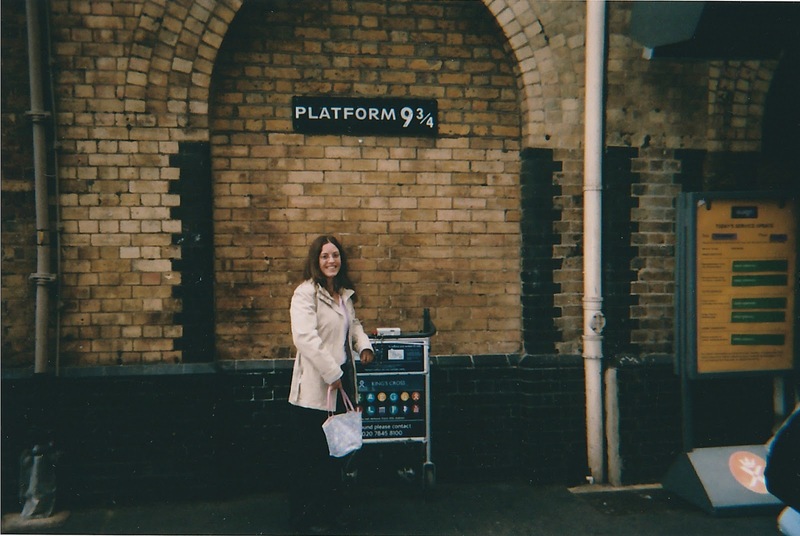 Harry Potter was, of course, a pretty big deal at that time, so there was half a luggage cart pushed up against the barrier between the platforms, along with a sign saying "Platform 9 ¾". But you'll notice in my picture below that there's nothing much else around it, and there are some other signs off to the right side that are signs about track work or something. There wasn't a line to take a picture there, and no one was paying this spot any particular attention. Mostly there were a lot of commuters trying to get onto their trains. There certainly was no professional photographer on hand. 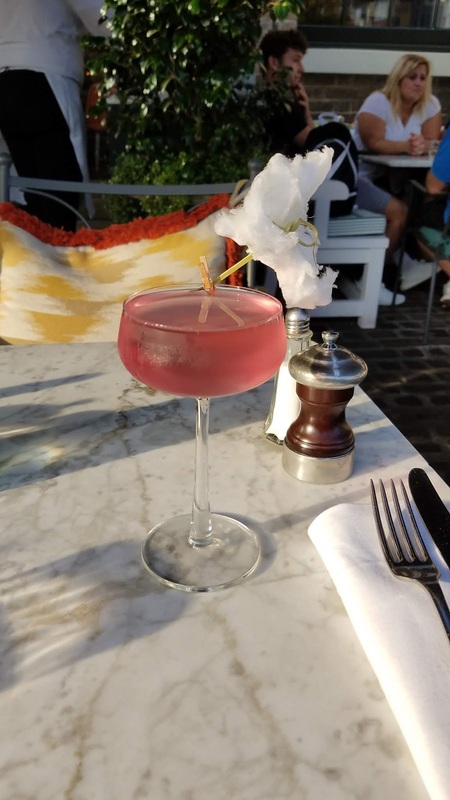 Cut to September 2018. 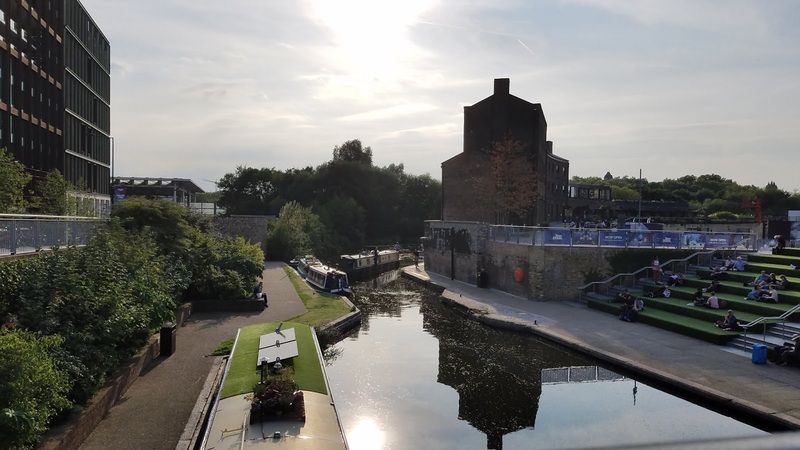 King's Cross has had an overhaul in the intervening 13 years (how is it that many years?). One of the things added was the Platform 9 ¾ Store (yes, an entire STORE full of HP merch) and a whole set-up to get your picture taken. It's not actually between platforms 9 and 10; it's nearby. And while there is a cart and a sign saying "Platform 9 ¾" (just like in 2005), there is also a professional photographer, a selection of wands and scarves to accessorize with, and a person there to direct the proceedings, because there is a line. When I was there, the line was fairly long. At first, I decided to skip that nonsense and just buy some things in the shop. A friend had asked me to pick something up for her, and I wanted one of the Slytherin-themed 25-year-anniversary books. (Oh, yeah, by-the-by, I'm a Slytherin according to Pottermore. [Hiss.] I think I'm actually more of a Ravenclaw, but I've run with the idea of being a Slytherin because it's so shocking.) Once I'd gotten my loot at the store, though, I took one look at the line and said, "Aw, what the hell. I came all this way." So I got in line behind two young British boys, brothers who were about 7 or 8, just a little older than my nephew. And these two kids were delightful. They said they'd taken the bus there, and told me where they'd come from (I didn't catch the name of the place, though). They asked where I'd come from, and I said, "America". The wide-eyed look they gave me was utterly priceless. 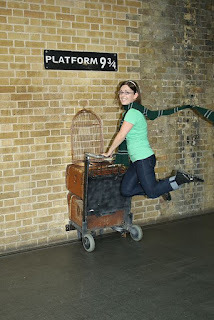 I added that I hadn't come just for Platform 9 ¾, because that would be something, wouldn't it? But we got to chatting, and we talked about favorite characters and which house we would like to be in. The boys had seen the movies and begun reading the books. Their mom was nearby, by the way, though she didn't really stand in the line with them. They went up together and got their picture together and separately--both wore Gryffindor scarves--then scuttled off to get prints of their photo. Those kids made the experience worth it. Standing in line was almost better than the picture itself. And with that, Day 1 of my UK was done.